A P J Abdul Kalam Technological University which was constituted in 2015 has consciously decided to ensure that e-Governance backed by innovation and application of technology will constitute the basis of enabling the functioning of the University. University at that time couldn’t find a suitable or similar IT environment in other Universities to emulate and end up venturing into its own path of establishing such a system. University has decided to ensure that the solution will be in open source, custom built, integrated, intelligent and owned by University. The goals established for the system was to ensure the speed of service delivery, ease of use, transparency and best use of technology. The solution was envisioned with core characteristics like data integration and consistency, scalability and end to end digital data. 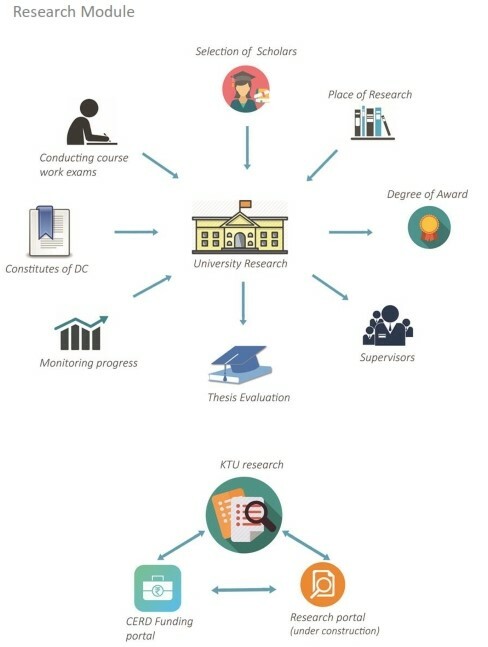 University was aware that such a system can only evolve through years hence took an approach of building and enhancing the system on a step by step basis. 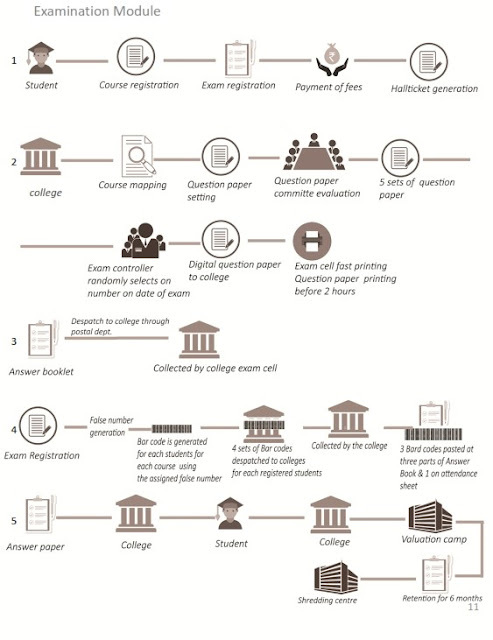 University could establish portion of e-Governance system from day one of University operation and was able to conduct all student registrations, examinations, affiliations and all other core activities through the system. The system has been under addition and enhancements since then. This system has helped the University apart from bringing accountability and transparency, some unique achievements with respect to publishing of examination results. For example, first semester results was published within 31 days of completion of examination which was a record among Universities in Kerala. 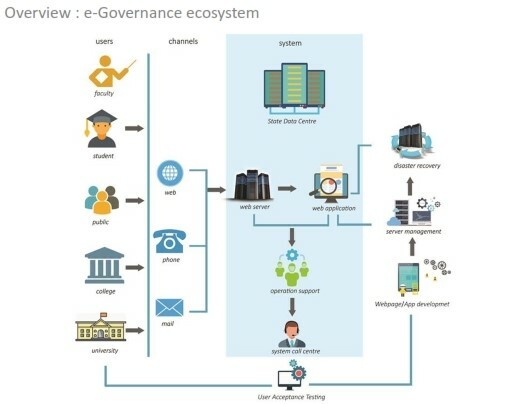 University is in process of establishing an integrated and intelligent next generation e-Governance ecosystem. Above picture shows the planned environment which is currently under various stages of life cycle. All the core applications and integrated file management systems are already in production. ERP application, development of common framework are in development and/or implementation phases. The complete ecosystem is planned on open source platform and mostly custom built. 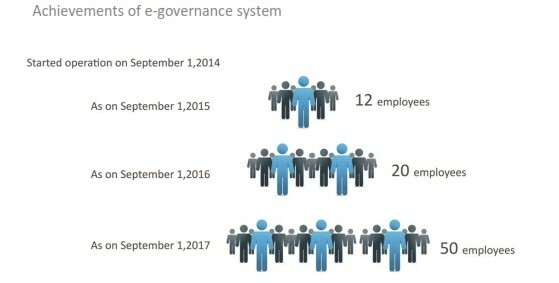 The University adopted continuous e-governance development approach to ensure the activities are not hindered while waiting for full system to be in place. Improve and effective services to all stakeholders, including students, faculty and management. Transparency and accountability in University functions and decision making . Rule based information for error free and consistent decisions. Digital transformation in cash transactions, exam result processing, course handling, and student life cycle. End to end service maturity resulting in capture and storage of digital data, which could be used for future decision making and policy formations. At KTU, e-governance is its core foundation and forms the platform for all its activities and is recognized as one of its major strengths. Each University stakeholders have their own unique secure access. System can be accessed through the web portal, call center or email. 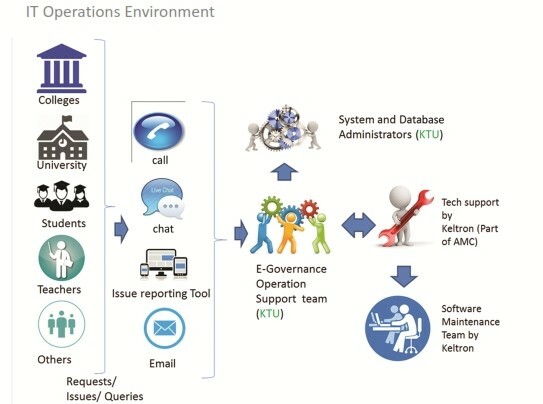 System call center provides key interface for stakeholders to address system related issues on a timely fashion. University has established separate production and user acceptance testing environment. This has helped to segregate development ecosystem from production which has in turn helped to ensure confidentiality of production environment and its information. Close working of operation support, software development and system management groups ensure time bound software enhancement mechanism. This forms the base for maintaining the vitality of the system on continuous fashion. Correspondence wit the stackeholders including students,faculty members and college authorities are only through official emails. Automated file flow system helps to establish a paperless office in all file handling activities. 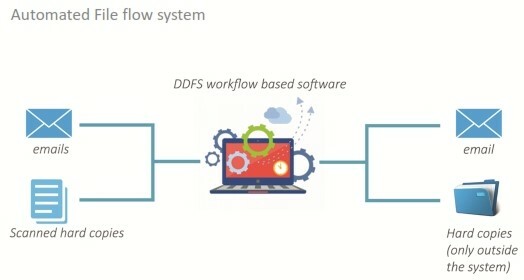 University has established automated file flow system from its initial days of operation itself so that all files in University remains digital. The file flow system hosted in State Data Centre is accessible over internet and is available for all University officials. All correspondences will be scanned and uploaded to the system. Routing of files are done automatically. System has helped to ensure faster decision making, accountability of any document uploaded to the system and faster internal circulation within the system . This helps to ensure that all the files are trackable with relative easiness. All file activities are recorded through the log facility and this can be audited. 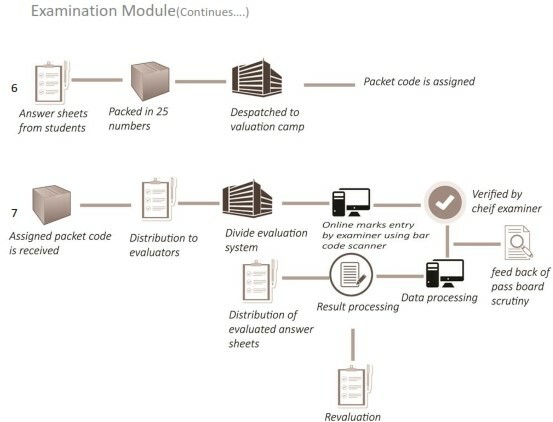 All order or documents generated by the system contains unique order number as well as 2D bar IQR code. This helps the faster recovery of documents. The system also has meeting management module which helps to organize meeting at University level and record minutes which remains accessible forever. 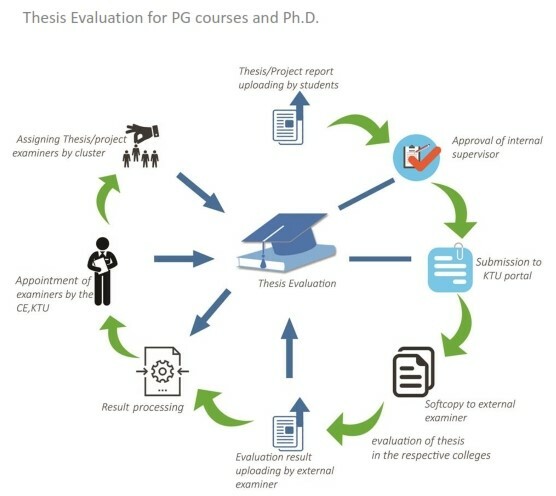 The affiliation process and its renewals are done through the online affiliation module.The documents are uploaded with the application.A hard copy of the bond executed should be sent through post.The affiliation approval gives the information as the courses and intake which forms the vital information for the remaining modules. Affiliation Module automates the full affiliation process of colleges with University. Affiliation application : Interested colleges, can submit completed affiliation application along with all required documents through e-Governance portal which is accessible over internet. 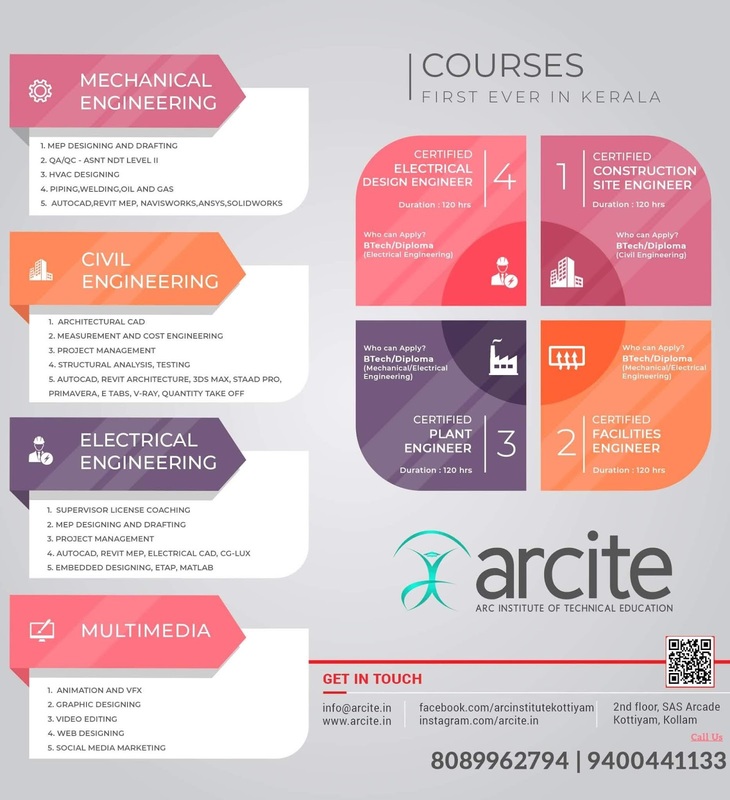 Colleges have provision to submit necessary fees through this portal. 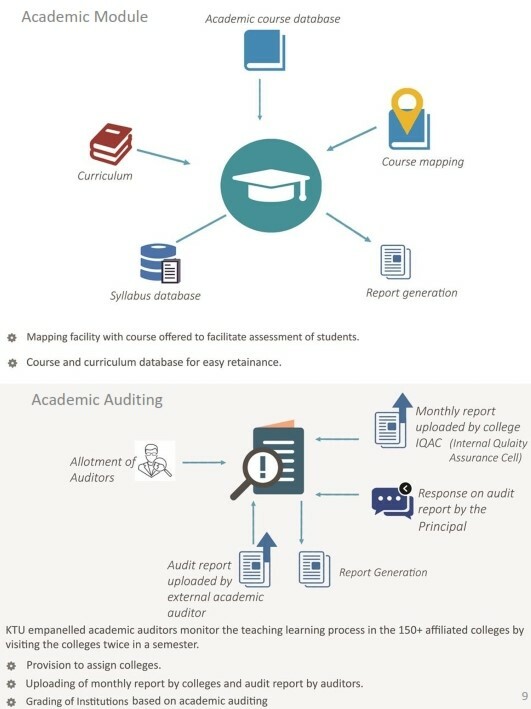 Expert visiting Committee(EVC) management : System automatically generate report as required by EVC based on documents and information submitted by Colleges through online application. Schedules EVC visit and results will be uploaded to the system. This along with AICTE information and other required information forms basis for University to make decision on affiliation application. Once decision is made, the result will be available on e-Governance portal under concerned college login for their access. 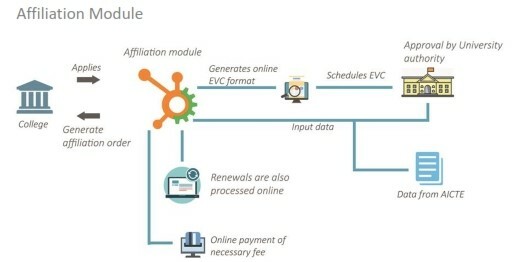 Affiliation renewal process also forms part of affiliation module and works completely automated. 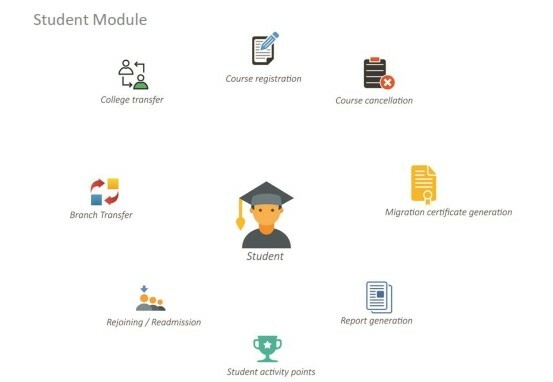 In each semester,a student register for the course and semester examination,from their unique portal login.Faculty/Adviser/Principal approves the registration through the system. All student information entered by students through online,are verified by Faculty/Adviser/Principal. Time tested, secure and effective online question paper module. Examination conduct module handles conducting of exam and distribution of answer sheets to valuation camps in effective manner. 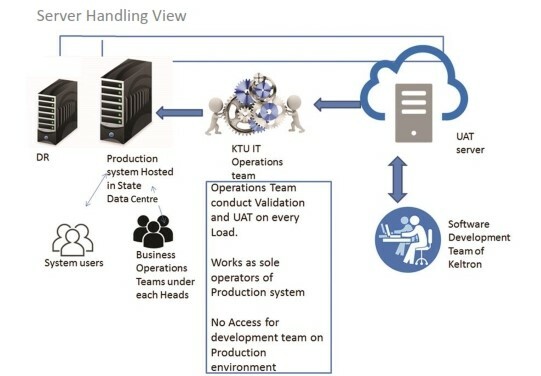 University’s server management had clearly separated access of development team from production environment. Production access is limited only to the University officials. All the production servers including e-governance application, file flow application, web servers and UAT Servers are hosted in State Data Centre(SDC) of Kerala IT mission. All server requirements are met through state data center cloud server services. This helps the University to provide a highly secured and protected server environment. University doesn’t posses any physical server in its premises. This provides huge cost saving by avoiding procurement of server hardware, running cost and its maintenance. The Disaster Recovery (DR) server ensures zero downtime during any unforeseen disaster situations. Disaster Recovery (DR) environment of the University is at NIC Data Centre under the Department of IT, Government of India. IT support and operational teams form core pillars for sustaining the functional flow and addressing various grievances of stakeholders. The team operated from University premise is accessible through various channels by stakeholders. Once a problem is reported, the team does initial assessment and assign the issue either to the concerned University department official or to the technical support team for technical investigation. After analysis, its is ensured that the concerned stakeholder is properly updated with status or outcome of the issue/concern. University is in the process of implementing advanced Interactive Voice Response(IVR) technology supported with automated issue tracking system enabling the stakeholders to reach out to the University IT support team. Both these technologies enable University to record and track the concerns of stakeholders. This will ensure timely updates and leads to accurate resolution of the issues raised by the stakeholders. This also helps the University to analyze the issues more accurately . Any trends and larger issues which can be understood by analyzing the reports will help University to address them more systematically. Maintaining and enhancing complex e-Governance eco system using zero hardware procurement and using Kerala State IT Mission cloud services. 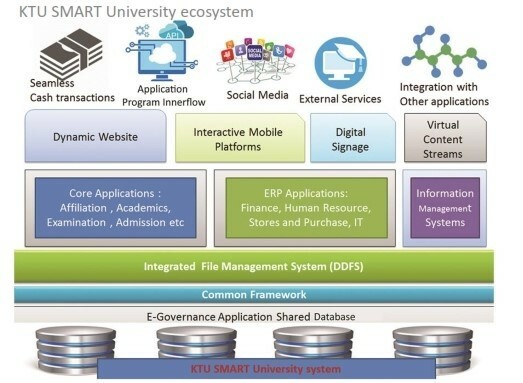 KTU- e Governance System- An overview | app.ktu.edu.in INTEGRATED NEXT GENERATION e-GOVERNANCE PLATFORM A P J Abdul Kalam Technological University which was constituted in 2015 has consciously decided to ensure that e-Governance backed by innovation and application of technology will constitute the basis of enabling the functioning of the University.